I recently wanted to augment my available flash modifiers, seeking a modifier with more directional light than the shoot through umbrella I normally use, but that was also larger than the 24″ softbox I also have available to me. However rather than buy a bigger softbox, which comes with transport issues, I decided to go with an Umbrella Softbox, or Brollybox. The L-Bracket mounts onto what is a standard umbrella bracket, modifying the plane of your flash from vertical to horizontal. 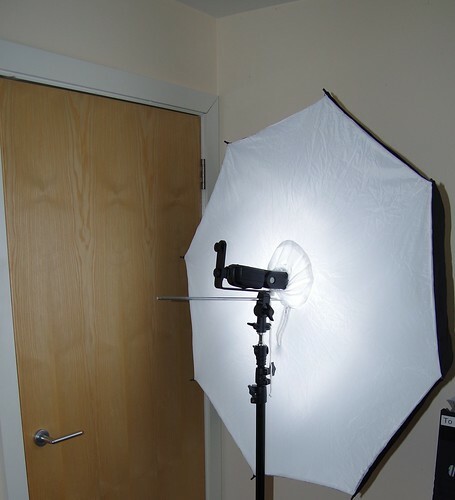 The Walimex umbrella works excellently with the mount above, allowing a full range of motion, and meaning you can get the umbrella nice and close to the flashhead, allowing it to be enclosed inside the umbrella box. I’ll post back when I’ve captured some shots in anger with this particular modifier. Hope that helps you get your own brollybox up and running!